New Delhi: On August 24, 2018, Bharat Exhibitions organized the 4th edition of National Summit on 100 Smart Cities India 2018 and the theme of this event was ‘Roadmap for Innovations, Sustainability, Surveillance and Development for smart Cities’. The main objective of the forum was to explore various aspects of infrastructure that needs to be planned, designed, built and operated in order to provide the ‘Smart’ attribute to a city development. There were also conversations about the key challenges that are being faced in the implementation of smart cities. Mr. Chetan Hebbalae, Senior Director of Product Management, Cambium Networks said, Traffic control, public Wi-Fi, increased public safety through video surveillance, and increased efficiency for municipal services are the cornerstones of any smart city initiative. Each of these requires reliable connectivity to reach control systems, access points, cameras and sensors in dense urban environments. Wireless broadband is a proven cost-effective solution that can be rapidly deployed to provide an affordable infrastructure to enable these applications. Smt. Shubha N. Bhambani, PGM (C&M), Bharat Sanchar Nigam Limited said, “Smart city initiatives provide a catalyst for urban communities to become more resilient and sustainable. BSNL has a strong focus towards smart cities and is constantly developing new cost-efficient and indigenous smart solutions”. While we keep talking about what will be the enablers for Smart City and the challenges we are facing, Mr. NSN Murty, Partner & Leader (Smart Cities), PwC brought the attention to the fact that it is actually the citizens that have voted for it and asked for it. “It is the first, world’s largest competitive exercise by means of which these cities have been selected”. He also touched upon how the to intend has now moved from the center to state. “It is always a central government initiative but now there is an increased interest at the city level”. Shri Rajan S. Mathews, Director General, Cellular Operators Association of India agreed that the intent was there and said, “To realize the vision of Smart Cities the government and the industry have to come together along with all of its subsidiaries to put forth a cohesive effort”. While the intent is certainly there, the adoption may not be happening at a similar pace. To elaborate the same Mr. Vineet Kshirsagar, Director for Government Business, NetApp Marketing & Services Pvt. Ltd., spoke on how the digital transactions were still very low. He added, “The role is ICT is very critical in this sphere. When it comes to ICT, data is extremely critical. We are participating in many smart cities and going forward we know that there will be a lot of data that will be generated. So there is clearly a need to make a data fabric for smart cities”. During the course of the conference, Mr. Sunil Joshi, President, Business Operations, GIFT City gave the delegates a glimpse of the kind of work that has been happening in this sphere in GIFT City. He mentioned, “GIFT provides a business platform and it is the first operational Smart City and IFSC, which is generating a large number of employment opportunities in the region”. Shri Vinit Goenka, Member of Governing Council and CRIS, Ministry of Railways and Member Taskforce IT, Ministry of Road, Transport & Highways and Shipping, Govt of India, said, “While answering why do we need smart cities, we should address the three Es. Whether it is Ethical? Are we being Environment-friendly and lastly if it is economical? It has to have some economic gain”. Apart from sustainability, there were other challenges such as data protection, surveillance etc were also touched upon in the forum. 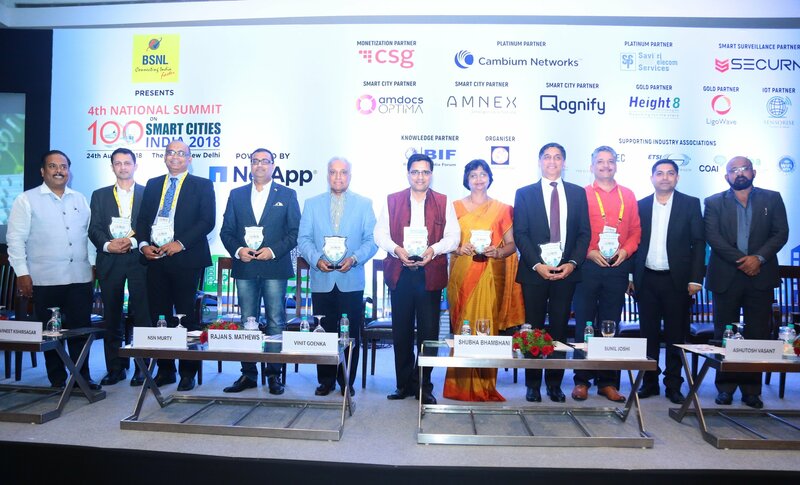 National Summit on 100 Smart Cities India 2018 was sponsored by Bharat Sanchar Nigam Limited, NetApp, CSG, Cambium Networks, Savitri Telecom Services, Secura, Amdocs Optima, AMNEX, Qognify, Height8 Technologies, LigoWave, and Sensors. The event was supported by CEN, CENELEC, ETSI, COAI, TAIPA and WiFi SPFI and the Knowledge Partner was Broadband India Forum.